No news is good news. And we’ve pretty much remained news-free on this trip. I watched one movie on the ship; it was a period piece about Jung and Freud in Vienna so it counted as research. CNN was verboten! But every now and then WiFi clicks in and my Facebook newsfeed explodes. It seems that Hillary has secured the nomination, and terrorists have bombed TelAviv. I saw that four people were killed on my way out of breakfast in the hotel lobby. CNN is inescapable on land. And if it’s Thursday, we’re in Prague or (Praha) in the Czech Republic. Those of you following my Instagram account know what we’ve been up to. Yesterday we set off for one of this beautiful city’s 200 museums to see their Mucha exhibit of the Slav Epic. In the 1920s he painted 19 canvases depicting the history of the people – serfs, saints, and sinners. Each painting measured about 20 ft square. Like this city, it’s nearly impossible to convey Mucha’s art in a mere iPhone photo. Today we toured the Old Town where a once vibrant Jewish community lived. We walked around the cemetery that was higher than two stories because 12 levels of graves were buried there. We read the names on the walls of the Pinkus Synagogue of the 80,000 Czech Jews who were killed. We saw the bronze plaques on the street with the names of a Jewish family that once lived there. 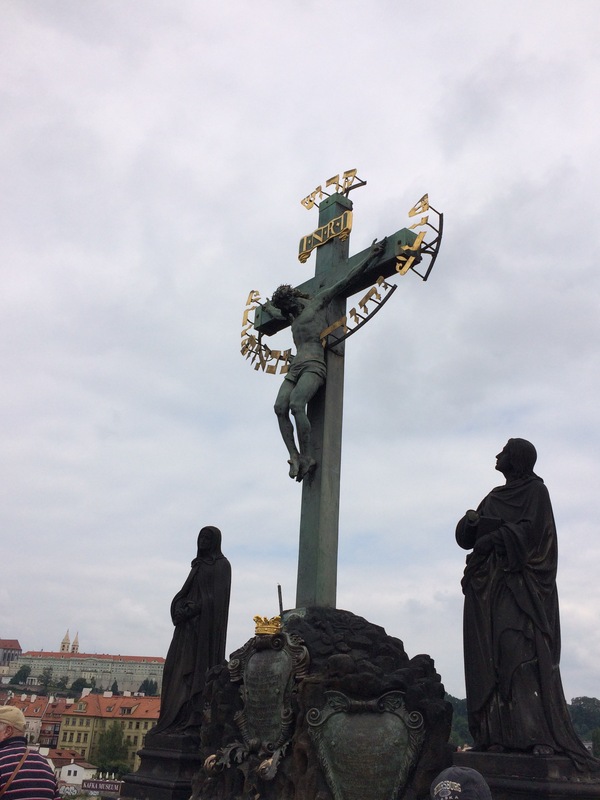 We crossed the Charles Bridge filled with religious statues and the crucifixion of Christ on the cross surrounded by Hebrew letters. This was done to humiliate the Jewish population. The news from Europe in the 20s and 30s was screened and buried inside the American press. FDR took too long to enter the war and stop Hitler. Read and watch the news about our election with a critical eye, ask yourself who owns what paper or media outlet. What is their agenda? Our humanity rests on our vigilance.